The Hyundai Santa Fe is a popular crossover SUV that offers the room and performance of an SUV and the comfort and style of a car, as well as the safety features needed in both. Stop at tony Hyundai Honolulu and allow us to show you the various safety features offered with the Santa Fe. The Blind Spot Detection system uses radar sensors to keep you apprised of any vehicles that are approaching from the rear. It now only alerts you but will also apply the brakes for you automatically. 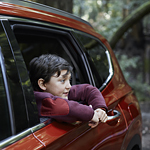 The Safe Exit Assist system, which also uses radar, keeps passengers aware of any vehicles approaching from the rear and will alert them to get out of the vehicle. Give us a call or pay us a visit at our shop to take the new Santa Fe out for a test drive. You’ll love everything about this crossover.